Okay, so I downloaded ubuntu and used unetbootin to load it up on my hard disc. I now can either select unebootin or windows at my bootloader, which was my intention. I just don't know how to permanently install ubuntu while I have the OS running. If you look closely, you can see that the installer is warning you that you are loading from the hard disk partition sda3 and you will not be able to install it into the same. If you provide a LiveCD iso file, such as the Ubuntu desktop iso, to UNetbootin and use the hard disk install mode, the resulting install will NOT be a full, standard hard drive installation. Rather, you are simply booting into the live environment, the same way as if you had booted from a live CD or a live USB, except it's being loaded from your hard disk instead. This is often referred to as a "frugal install", as it doesn't install a dedicated bootloader and doesn't make a separate partition, but rather piggybacks off the existing OS's bootloader and installs the files for the live environment inside the existing partition. You have to use a USB drive and make it bootable using unetbootin, and then boot from that USB drive and install the OS onto your hard disk. You must set up your partitions before going into the hard disk installer. 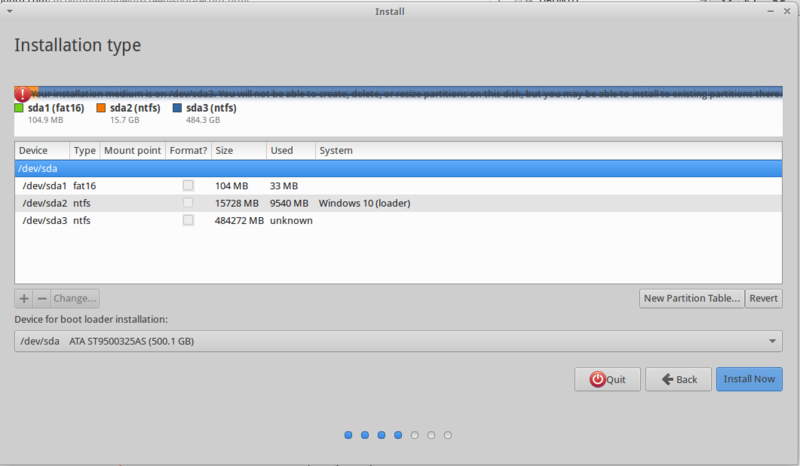 Once you've set up your Ubuntu partition you can install Ubuntu with the installer by selecting and formatting that partition. Not the answer you're looking for? Browse other questions tagged boot dual-boot unetbootin or ask your own question. Latest Version of Ubuntu Desktop burned to DVD won't start through Windows 10? Install Ubuntu 16.04 in another partition on HP Laptop with Windows 10?